In addition to rail lines, TriMet provides the region's bus system, as well as LIFT paratransit service. There are 688 buses in TriMet's fleet that operate on 85 lines. In 2018, the entire system averaged 310,000 rides per weekday and operates buses and trains between the hours of approximately 5 a.m. and 2 a.m. TriMet's annual budget for FY 2018 is $525.8 million, with 30% of resources coming from a district-wide payroll tax and 10% from fares. The district is overseen by a seven-person board of directors appointed by the state's governor. In 2014, the agency has around 2,500 employees. TriMet is "a municipal corporation of the State of Oregon", with powers to tax, issue bonds, and enact police ordinances and is governed by a seven-member board of directors appointed by the Governor of Oregon. It has its own boundary, which currently encompasses an area of about 533 square miles (1,380 km2). The TriMet district serves portions of the counties of Multnomah, Washington, and Clackamas; it extends from Troutdale to Forest Grove east to west, and from Sauvie Island to Oregon City and Estacada north to south. For more than 30 years the agency called itself Tri-Met, but it formally dropped the hyphen from its name in 2002, as part of a new corporate identity strategy involving a redesigned logo and new color scheme for its vehicles and other media. TriMet was formed in 1969 after disputes between the Portland city council and Rose City Transit Company, the private company that previously operated the bus system serving the city (but not its suburbs). The new public agency was created by an ordinance of the Portland city council, under provisions of a law enacted by the 1969 Oregon Legislature, and took over all of Rose City Transit's service and fleet effective December 1, 1969. Bus service in the suburban portions of the metropolitan area was operated by four smaller private companies which had a common union and were collectively known as the "Blue Bus" lines: Portland Stages, Tualatin Valley Buses, Intercity Buses and Estacada-Molalla Stages. These were taken over by TriMet on September 6, 1970. Eighty-eight buses owned by the four suburban companies were transferred to TriMet, but many were found to be in poor condition and the TriMet board soon took action to replace them with new buses. TriMet's first paint scheme was this orange and white, worn by all vehicles from 1971 until 1980 and by a portion of the fleet (the oldest buses) until 1991. As of July 2018[update], TriMet operates a total of 688 buses on 85 routes, 145 MAX light rail cars on five lines, and 253 LIFT paratransit vehicles. Each of the five MAX and 12 of the bus lines are designated as "Frequent Service" lines, scheduled to operate at headways of 15 minutes or less for most of the service day (service is less frequent in the early morning and late evening). Cherriots, the public transit service for Salem and Keizer. This connection is at the Wilsonville Station of TriMet's WES Commuter Rail rail line. TriMet also links to various local shuttle services operated by the following: Ride Connection, which serves Banks, Gaston, King City and North Plains; the Swan Island Transportation Management Association; the Tualatin Transportation Management Association; Intel; Nike; and Oregon Health & Science University, including the Portland Aerial Tram. Long-range transportation planning for the metropolitan area is provided by Metro, an elected regional government. Metro also has statutory authority to take over the day-to-day operations of TriMet, but has never exercised that power, as past studies of such a merger have found it to be problematic. TriMet runs the MAX Light Rail (short for Metropolitan Area Express) system, and contracts with Portland and Western Railroad to operate the WES Commuter Rail line (short for Westside Express Service). 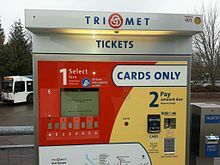 Fares on MAX (as well as WES) are the same as TriMet bus fares, and fare collection uses a proof-of-payment system (or honor system) with ticket vending machines at each station. Fare inspectors patrol the system randomly. Incidents of violence on the system have led to calls for more security, and some have argued that more thorough checking of fares would improve riders' overall feeling of safety. The TransitTracker system uses satellite tracking on buses and sensors in the MAX tracks to predict arrival times at stops and stations. Additionally, TriMet is partnering with Google Maps to install Bluetooth low energy beacons on MAX platforms, allowing nearby Android device users to directly receive schedule and alert information. TriMet trains operate using reporting mark TMTC. From 1991 until 2014, TriMet also operated the Portland Vintage Trolley service, which ran on a portion of the MAX system on most weekends. It was reduced to only seven dates per year in 2011 and was discontinued entirely in July 2014. Additionally, the Portland Streetcar system, which is owned and managed by the City of Portland, not TriMet, is operated and maintained by TriMet under contract with the City of Portland. TriMet also provides a portion of the funding for the streetcar lines. A bus stop sign of the current design (2000-present) with frequent service. As of September 2018[ref], TriMet operates 85 bus routes. [not in citation given] Each route is identified by both a number and a name. The numbers are mostly in the range 1–99, but there are currently six routes with three-digit numbers. From 1969 until 1973, TriMet bus routes were named but not numbered, a practice inherited from Rose City Transit and the "Blue Bus" lines, but route numbers were assigned to all routes in August 1973. Twelve bus routes are designated as "Frequent Service Lines", which the agency defines as having a headway of 15 minutes or less most of the service day (service is less frequent in the early morning and late evening). Fifty-eight percent of all bus trips are on the frequent service lines. Bus stops that are served by a frequent service line are identified with additional green sign. The bus system includes 17 transit centers, that allow passengers to transfer between bus routes and, at many transit centers, MAX routes. TriMet buses began carrying bicycles on the front in 1992, on a trial basis on eight routes; the experiment was judged a success and within three years the entire bus fleet had been fitted with bike racks. Each rack can hold two bikes. TriMet uses a "flat" fare system, with a single price (for each category of rider: adult, youth, senior or disabled) regardless of the distance of the trip. However, the single-fare tickets permit unlimited transfers to other routes within 2½ hours and passes are valid until end of the service day. Several different methods of fare payment are available. On buses, riders can pay with cash, but no change is given. On the MAX Light Rail system, in common with most other North American light rail systems, and on the WES Commuter Rail line, TriMet uses a proof-of-payment fare system, requiring riders not already in possession of a valid fare to purchase or validate one before boarding. Ticket vending machines at MAX and WES stations accept cash as well as credit and debit cards. For both bus and rail riders, a number of other payment methods are available as an alternative to cash. TriMet tickets and passes are also valid on the Portland Streetcar, which is owned by the City of Portland but operated mostly by TriMet personnel under a contract with the city. TriMet also has a mobile ticketing app, allowing riders to purchase and use tickets for buses, light rail, and commuter rail on their smartphones. The app, called TriMet Tickets, was developed by Portland startup GlobeSherpa (now Moovel Transit) and released in September 2013 at no cost to TriMet. Instead, Moovel Transit will take a commission on every ticket sale through the app. An e-fare system named "Hop Fastpass" was introduced in July 2017. Developed by INIT (Innovations in Transportation) for TriMet, the City of Portland, and C-Tran, at a cost estimated (in 2015) to be about $30 million, the new Hop Fastpass system enables riders to pay with a fare card, using card readers on buses and train platforms, and, as of August 2017, using a smartphone equipped with NFC (near field communication) via a digital wallet. The name is said to evoke both the speed of the rabbit and the hop plant used as an ingredient in the craft beer brewed in Portland. In early 2019, TriMet introduced a new paint scheme, the first such change since 2002. It is seen here on Gillig BRT-model bus 3913. TriMet's first battery-electric bus entered service on March 4, 2019. It is shown using the overhead charger at Sunset Transit Center on that date. As of July 2018[update], TriMet's fleet included 688 buses, in lengths of either 40 or 30 feet (12 or 9 meters) for use on traditional fixed-route services. TriMet also owns a fleet of 253 minibuses and 15 vans for use on LIFT Paratransit service. By March 2017, the entire active fleet of regular buses were low-floor models and equipped with air-conditioning. This was the culmination of a plan launched 20 years earlier. In 1997, the TriMet board decided that all buses purchased in the future should be low-floor type and equipped with air-conditioning. The decision was for a gradual phase-out of high-floor, non-air-conditioned buses as they reached the ends of their normal lifespan (about 18–20 years) and in 2013 TriMet was anticipating that by 2017 all buses would have low floors without steps. TriMet retired its last non-air-conditioned buses in late December 2015. The last series of high-floor buses in service (40-foot Gillig Phantoms built in 1997, the 2100 series) were taken out of regular use in June 2016, but with some kept serviceable through the summer for use on temporary shuttles during construction-related disruptions to MAX service that took place between August 21 and September 3, 2016. TriMet does not currently operate any 60-foot (18 m) articulated buses. However, the Division Transit Project, a high-capacity line currently under development and projected to open in 2022 if it receives final approval and the needed funding, would add 60-foot (18 m) articulated buses to the TriMet fleet. While most of TriMet's fleet uses diesel motors for propulsion, the agency has also experimented with hybrid electric buses. The first two hybrid buses entered service in 2002, but in 2008 TriMet stated that the buses had not performed sufficiently better than its newest diesel buses to justify the estimated 50-percent-higher purchase cost, and that consequently the agency had no plans to purchase additional hybrid buses at that time. These first two hybrid buses were retired in 2012. However, with hybrid technology having improved since that earlier purchase, TriMet acquired four new hybrid buses in 2012 and placed them into service in January 2013 on line 72, a long, mostly level north–south route. TriMet acquired four more hybrid buses in 2015 with even greater electronic technology on board. Since October 30, 2006, all TriMet buses and paratransit minibuses have been fueled by a B5 biodiesel blend. Plans to increase to a B10 or higher mix were later put on hold as a result of cost increases and problems experienced in a trial use of B10 blend in about one-quarter of the fleet. The agency delayed new bus purchases for four years due to the recession of 2008 and the resulting decrease in income from taxes. In 2012 TriMet began to replace buses on an accelerated schedule. By that time some of the buses in the fleet were more than 20 years old and had become more expensive to maintain and less reliable. The first order of 55 40-foot Gillig buses began to enter service in fall 2012, followed by 70 buses in 2013, 60 in the summer of 2014, followed by another 30 in October 2014. In early 2015, TriMet received its first new 30-foot buses in more than 20 years. These 22 Gillig buses are similar to the rest of TriMet's new buses, but their shorter length allows them to serve routes with tighter turns and difficult terrain. By mid-2016 TriMet planned to have 326 buses on the road under 4 years old, which would allow the agency to meet the industry standard of an average age of eight years. TriMet's 3900-series buses, an order of 64 diesel buses built in 2018 and 2019 and entering service in February 2019, introduced a new paint scheme for the agency, of all-over blue with a trio of semi-upright orange stripes near the rear on each side. TriMet's buses operate out of three garages: Powell Garage to the east, Merlo Garage on the west side, and the Center Street Garage in inner Southeast Portland. TriMet's fleet includes 145 light rail vehicles, of four general types: TriMet Type 1, Type 2/Type 3 (almost identical), Type 4 and Type 5. The first two cars of Type 5 entered service in April 2015. The capacities given are for a single light rail car; a two-car train has double the capacity. The commuter rail line between Beaverton and Wilsonville is operated primarily with trains made up from a fleet of four Colorado Railcar Aero diesel multiple unit railcars. TriMet also owns a pair of Budd RDC diesel multiple unit railcars that are used as a backup. 1969 Tri-Met takes over for the nearly bankrupt Rose City Transit Company. The system has 175 buses and a daily ridership of about 65,000. 1970 Tri-Met takes over the "Blue Bus" companies, the four companies which had been providing bus service to and within Portland's suburbs, adding another 88 buses to the agency's fleet. 1973 Route numbers (or Line numbers) are adopted for the first time; previously, routes had been designated only by names. 1974 The first shelters at bus stops are installed. 1975 The "Fareless Square" is created in downtown Portland, with the goal of reducing short automobile trips within the city core and attracting more riders. Fares outside the Square are 35 cents. The zone-based fare system was discontinued at that time, but was reinstated less than four years later and remained in use until 2012. 1977/78 The 22-block Portland Transit Mall opens on downtown's Fifth and Sixth Avenues. The mall includes bus-only lanes and provides a hub to make it easier for riders to make connections. 1978 After 3½ years using a "flat" fare system, a zonal fare structure is reinstated, with three fare zones. Zone 1 consisted of downtown Portland and extending about one to two miles (3 km) out. Zone 2 was a ring around Zone 1 out two to three more miles. Zone 3 wrapped around Zone 2 and consisted of the rest of the system within the suburbs of Portland. 1981 24-hour recorded schedule information becomes available over the phone. One of TriMet's articulated buses, in service 1982–99. 1982 Tri-Met introduces articulated buses for the first time. The buses were manufactured by Crown-Ikarus, a now-defunct partnership between Ikarus, of Hungary, and Crown Coach, of California, but they proved to be sufficiently trouble-plagued that the agency later sues the manufacturer to recover expenses tied to excessive repairs; a settlement was reached in 1987. The last bus was retired in 1999 and TriMet has not purchased any more articulated buses since. 1982 In September, Tri-Met introduces a proof-of-payment (or "self-service") fare system for all service, but discontinues it in June 1984, due to fare evasion, high equipment repair costs and other problems. 1986 As part of a package of budget cuts, Tri-Met discontinues its all-night "Owl" service, making Portland the second largest U.S. city without all-night transit service. Seven regular (daytime) bus routes also were eliminated. 1986 The 15-mile (24 km) long MAX light rail line between Portland and Gresham opens. It reintroduces rail transit service to the Portland area, missing since the 1950s. 1989 Tri-Met is named the best large transit system in North America by the American Public Transit Association. For more than 40 years, until 2015, TriMet's fleet included buses built by Flxible, an example of which is the 1992 Flxible Metro shown in this 2013 photo. 1992 The first bike racks are installed on the fronts of some Tri-Met buses, as part of a one-year trial project. 1995 Tri-Met's website goes online, hosted by local ISP Teleport (which eventually becomes acquired by OneMain.com, later to become part of Earthlink). At the time when Internet access was less ubiquitous, Tri-Met also offered a dial-up information service through Teleport using a Unix shell and Lynx. 1996 Tri-Met begins to equip its bus fleet with vehicle tracking system equipment, to enable monitoring of buses in service, using GPS technology. 1997 The first low-floor buses and light-rail cars go into service. 1998 Westside MAX (now known as the Blue Line between Portland and Hillsboro) opens. Tri-Met also establishes bus lines that come every 15 minutes or sooner everyday, lessening the need to consult a schedule when using them. 1999 Satellite-assisted bus arrival time displays (later to be named Transit Tracker) are installed at select major bus stops in North Portland and downtown. 2001 Fareless Square is expanded to a small portion of Northeast Portland between Lloyd Center and the Steel Bridge. Airport MAX (the Red Line) begins service on September 10 after a public/private partnership, prompted by a proposal from Bechtel Corporation, enables its construction years ahead of TriMet's plans for the use of public funds. Bechtel received exclusive development rights to 120 acres (486,000 m²) near the entrance to Portland International Airport. The original MAX line began to be referred to as the MAX Blue Line upon the opening of the Red Line. Bus sector symbols began to be phased out from maps and publications. 2002 With the September schedule change, Tri-Met launches a new corporate identity strategy. It is renamed TriMet (without a hyphen) and a new logo and blue, white and yellow livery are introduced. An improved automated phone service is introduced. 2004 Interstate MAX (the Yellow Line) opens along Interstate Avenue. The fleet has grown to 638 buses, 208 paratransit vehicles, and 105 trains with a daily ridership of over 300,000. 2005 TriMet introduces biodiesel fuel into its fleet, using a B5 blend (5 percent pure biodiesel, 95 percent petroleum diesel), initially on LIFT (paratransit) minibuses only. Use of B5 biodiesel was expanded to the entire bus fleet in late 2006. 2007 The Portland Mall, on 5th and 6th Avenues, is shut down for rebuilding and southward extension (to PSU), including adding a second light-rail alignment through downtown. The rebuilding, to take over 2 years, is part of the MAX Green Line project, but will also replace all infrastructure for buses on the already 29-year-old transit mall. Most bus routes serving downtown are detoured to other streets until 2009. 2009 The 14.7-mile (23.7 km) WES Commuter Rail opens on February 2. WES (Westside Express Service) provides service between Beaverton and Wilsonville with stations in Tigard and Tualatin in between. 2009 In May, the Portland Mall reopens for buses, and testing and training runs for the new Mall MAX tracks begin, for opening August 30. 2009 Due to the national recession's effect on the agency's finances, the board approves a series of service reductions, to take effect in September. The board votes on August 12 to discontinue Fareless Square for bus service beginning in January 2010, while retaining fare-free rides in the downtown area on MAX and the Portland Streetcar. 2009 On August 30, MAX service on the transit mall is introduced, with the shifting of the Yellow Line to the new alignment. September 12 brings the opening of the Green Line, also using the new transit-mall tracks, running from downtown (PSU) to Clackamas Town Center. It is TriMet's first light rail line serving Clackamas County. TriMet's Tilikum Crossing, built as part of the MAX Orange Line project, opened in 2015. 2012 TriMet purchases 55 new Gillig diesel buses to replace the aging fleet dating back to 1990. The last four of the new buses are hybrid-electrics estimated to be 20-50% more fuel-efficient and produce 95% fewer emissions; they replaced hybrid buses that were in service since 2002. 2012 TriMet discontinues "Free Rail Zone" (formerly known as the "Fareless Square") in Downtown Portland and ends use of three-zone, distance-based fare system. Until this time, the TriMet district was divided into three fare zones, with fares based on the number of zones in which a passenger traveled. 2013 TriMet purchases 70 new Gillig diesel buses to replace the aging fleet dating back to 1990. 2014 TriMet purchases 90 new Gillig diesel buses. 2016 TriMet purchases 77 new Gillig diesel buses. 2018 After 32 years without any all-night transit service, TriMet extends service hours on lines 20-Burnside/Stark and 57-TV Highway to run 24 hours a day. The agency also establishes Line 272-PDX Night Bus to provide early-morning service between NE 82nd Avenue and the Portland International Airport. Note: Items in the timeline lacking individual citations are taken mostly from TriMet's Rider Insider newsletter, November/December 2004 issue. Under the Division Transit Project, formerly known as the Powell–Division Transit and Development Project, a new bus rapid transit (BRT) line is planned to be created between Downtown Portland and Gresham, along SE Division Street. The 14-mile (23 km) line would roughly parallel the existing MAX Blue Line, partially replacing the existing Line 2 – Division (previously Line 4 – Division/Fessenden) and becoming the first BRT line operated by TriMet. Initial plans had the line traveling on the Tilikum Crossing, Powell Boulevard and then Division Street to the Gresham Transit Center, terminating at Mt. Hood Community College. Crossing over between Powell and Division would have taken place on either 50th, 52nd, or 82nd Avenue. However, after analysis showed that this routing would increase travel times from Gresham to Portland, the route was redesigned to solely travel along Division Street, dropping the Powell Boulevard portion. Improvements along the segment of Division Street between 82nd Avenue and 8th Avenue would include stop consolidation and traffic signal prioritization. The service would use higher-capacity, 60-foot-long (18 m) articulated buses. The route was originally planned to extend beyond line 4's terminus at the Gresham Transit Center to Mt. Hood Community College, but this section was dropped in September 2016 due to concerns over competitiveness for federal transportation funds. TriMet buses and commuter rail also serve Wilsonville, Oregon, which is outside the TriMet district, in order to provide connections to transit services operated by SMART in that city. The Boring area has been removed from the TriMet District effective January 1, 2013. An investigation by The Oregonian in 2013 led to the revelation that some TriMet drivers were working as many as 22 hours in a 24-hour period. There have also been 22 reported cases of drivers falling asleep at the wheel. In response, the agency adopted a new policy restricting the number of hours a driver is permitted to work within a 24-hour period. An investigation by several local Portland news outlets found that several of the MAX Light Rail ticket machines have extremely high failure rates. Many riders have claimed that they have received a fare evasion citation after boarding the MAX train without a fare after they have attempted to pay for a ticket. The official statement from TriMet is to ride to the next MAX station, de-board the train and pay for a ticket there and wait for the next train. This response has been deemed unacceptable both by riders and bus/rail operators. TriMet has begun replacing all of its older machines with newer machines, and cites a 50% drop in complaints. ^ a b c d "TriMet: Bus Service". Retrieved September 8, 2016. ^ a b c d e f g h i j k l m n "TriMet At-A-Glance" (PDF). TriMet. July 2018. Retrieved September 8, 2018. ^ "American Public Transportation Association - Transit Ridership Report - First Quarter 2018" (PDF). American Public Transportation Association. May 23, 2018. p. 28. Retrieved September 8, 2018. ^ a b c "The TriMet Story". History. TriMet. Retrieved 2009-10-09. ^ "New TriMet Budget Promises Improved Service, Cuts To Employee Health Benefits". Oregon Public Broadcasting. March 12, 2014. Retrieved September 8, 2014. ^ a b Leeson, Fred (August 14, 2002). "Tri-Met is changing its stripes". The Oregonian. Retrieved 2009-08-16. (Subscription required (help)). ^ "Tri-Met Takes Bus Control; Strike Averted" (December 1, 1969). The Oregonian, p. 1. ^ "Federman, Stan (September 2, 1970). "Tri-Met Action Averts Strike Of Bus Drivers; Agency To Assume Operation Of Four Suburban Blue Lines". The Oregonian, p. 1. ^ "Tri-Met To Get Blue Buses Sunday; New Suburban Runs To Start Tuesday" (September 5, 1970). The Oregonian, p.15. ^ a b "Tri-Met Takes Over Operation Of Blue Buses, Finds Rolling Stock In Bad Condition" (September 9, 1970). The Oregonian, p. 9. ^ a b c "TriMet: Frequent Service Lines". Retrieved September 12, 2015. ^ Other Local Transit Services. TriMet. Retrieved 2009-10-02. ^ "Schedules & Routes". Columbia County Rider. 2014. Retrieved March 28, 2014. ^ Stan Federman (January 18, 1988). "Pathway to altar for Tri-Met, Metro filled with financial, legal potholes". The Oregonian. ^ S. Renee Mitchell (December 13, 2007). "TriMet Safety". The Oregonian. ^ "TransitTracker". TriMet. Retrieved 5 April 2015. ^ Fetsch, Mary (March 9, 2015). "TriMet to provide riders with another way to access real-time transit information". TriMet. Retrieved 5 April 2015. ^ Tramways & Urban Transit, February 2014, p. 92. UK: LRTA Publishing Ltd.
^ a b Austin, David (July 20, 2001). "Streetcar safety". The Oregonian, "Back on Track" special section, p. 20. ^ a b "Tri-Met directors discontinue little-used experimental route" (August 7, 1973). The Oregonian, p. 15. ^ a b "Take a number .... It's a winner" (August 28, 1973). Tri-Met advertisement in The Oregonian, Section 2, p. 6. ^ a b Walker, Dee J. (June 18, 1992). "Tri-Met to kick off one-year trial of bike project". The Oregonian, p. C6. ^ "People will bike, walk" (editorial, February 21, 1995). The Oregonian, p. B6. ^ a b "Paying Fare Using Paper Tickets and Passes". TriMet. Retrieved November 25, 2018. ^ "Chapter 1 (Introduction and Overview), in TCRP Report 80: A Toolkit for Self-Service, Barrier-Free Fare Collection" (PDF). Transportation Research Board. 2002. p. 1-1. Retrieved November 25, 2018. ^ Barry, Keith (September 16, 2013). "Portlandia, Rejoice! Smartphone Fare System Coming to Mass Transit". Wired Magazine. Retrieved 5 April 2015. ^ Rose, Joseph (May 13, 2013). "TriMet unveils e-ticket app from Portland's GlobeSherpa, says technology is future of fares (video)". The Oregonian. Retrieved April 5, 2015. ^ Njus, Elliot (July 3, 2017). "Slow rollout begins for Hop Fastpass, the new transit fare system". The Oregonian. Retrieved July 5, 2017. ^ Altstadt, Roberta (2018-04-16). "Portland's Virtual Hop Fastpass™ transit card now available to all Google Pay users". Retrieved 2018-06-16. ^ a b Njus, Eliot (July 6, 2017). "TriMet's new electronic fare system dubbed 'Hop Fastpass'". The Oregonian. Retrieved September 4, 2015. ^ "Hop Fastpass: Your new ticket to ride". Myhopcard.com. TriMet. Retrieved July 6, 2017. ^ Redden, Jim (August 22, 2017). "TriMet: Hop passes now work on phones". Portland Tribune. Retrieved September 24, 2018. ^ "Better Buses". TriMet. March 2017. Archived from the original on April 7, 2017. Retrieved May 11, 2017. ^ a b Oliver, Gordon (June 26, 1997). "Tri-Met steers toward easy-access, air-conditioned fleet". The Oregonian, p. D1. ^ "The first batch of 70 new buses rolls into service Tuesday, July 23". July 22, 2013. Retrieved September 10, 2014. ^ "The Year in Review: 2015". How We Roll. TriMet. December 31, 2015. Retrieved 2016-01-11. ^ "Renewing our bus fleet". TriMet. July 12, 2016. Retrieved 2016-08-27. ^ a b Sparling, Zane (October 18, 2018). "60-foot TriMet buses may be coming to Division, Gresham". Portland Tribune. Retrieved October 26, 2018. ^ a b c d "Division Transit Project". TriMet. Retrieved July 5, 2017. ^ Boone, Jerry F. (May 6, 2002). "Tri-Met rolls out diesel-electric bus". The Oregonian. ^ Tribune staff (May 10, 2002). "PDX Update". Portland Tribune. Archived from the original on June 8, 2011. Retrieved April 5, 2015. ^ a b c d "Building a better bus". TriMet. 2013. Retrieved August 13, 2013. ^ a b Oberman, Lily (January 31, 2013). "TriMet unveils new hybrid buses; transit union responds with safety concerns". The Oregonian. Retrieved August 13, 2013. ^ Njus, Elliot (October 15, 2015). "TriMet shows off new generation of hybrid buses". The Oregonian. Retrieved February 4, 2017. ^ a b "TriMet becomes state's #1 biodiesel fuel user". TriMet. October 30, 2006. Archived from the original on June 7, 2011. Retrieved April 5, 2015. ^ Budnick, Nick (May 15, 2008). "TriMet's biodiesel ambitions hit wall". Portland Tribune. Archived from the original on June 8, 2011. Retrieved April 5, 2015. ^ Murphy, Angela (June 20, 2013). "New TriMet buses to begin service in less than a month". TriMet. Retrieved April 28, 2018. ^ Angela, Murphy (September 26, 2013). "New TriMet buses will continue to roll into service every year through 2019". TriMet. Retrieved June 8, 2015. ^ Rose, Joseph (October 3, 2012) [print edition October 4]. "TriMet rolls out new state-of-the-art buses in Portland on Thursday". The Oregonian. p. C2. Retrieved November 16, 2012. ^ Rose, Joseph (July 23, 2013) [online date July 22]. "A new look and a new ping for TriMet's buses". The Oregonian. p. 1. Retrieved August 13, 2013. ^ a b "Our new buses are hitting the road! The first of 60 new buses went into service this morning". TriMet. June 5, 2014. Retrieved 2014-08-10. ^ a b "TriMet's newest fleet of buses begins to roll into service". TriMet. October 10, 2014. Retrieved 2014-10-12. ^ a b c Murphy, Angela (March 24, 2015). "New 30-foot TriMet buses are now in service in areas with tighter turns and terrain". TriMet. Retrieved April 2, 2015. ^ Theen, Andrew (February 15, 2019). "Orange is the new bus: TriMet goes retro with new bus colors". The Oregonian. Retrieved February 16, 2019. ^ "First Batch of New Buses Take to The Streets". How We Roll. TriMet. February 17, 2016. Retrieved 2016-02-18. ^ Vincent, John M. (September 10, 2015). "Orange Line brings new railcars, updated originals". Portland catches the Orange Line. Portland Tribune. Portland, Oregon: Pamplin Media Group. pp. 44–45. ^ a b "PMLR Type 5 LRV Fact Sheet" (PDF). TriMet. March 2015. Retrieved May 3, 2015. ^ "MAX: The Next Generation". TriMet. 2009. Archived from the original on August 31, 2009. Retrieved 2015-04-04. ^ a b Colby, Richard (January 12, 1975). "Tri-Met eliminates fare zones, offers free rides downtown". The Sunday Oregonian, p. A38. ^ a b Hortsch, Dan (August 27, 1978). "Tri-Met riders will start paying higher fares on Sept. 3". The Sunday Oregonian, p. B7. ^ "Mall makes it". (December 12, 1977). The Oregonian, p. A1. ^ "Mall enters future - and it works!" (March 19, 1978). The Sunday Oregonian, p. M11. Excerpt: "Although the Portland Mall has [now] been officially dedicated, it has been in full operation since December." ^ Federman, Stan (January 24, 1982). "Introduction of articulated buses kicks off Tri-Met expansion". The Oregonian, p. B1. ^ Federman, Stan (March 4, 1984). "No wonder the sour look: Tri-Met bendable buses 'lemons'". The Sunday Oregonian, p. 1. ^ Federman, Stan (November 5, 1985). "Tri-Met sues over articulated bus defects". The Oregonian. ^ Federman, Stan (August 29, 1982). "All eyes will be on Tri-Met's new self-service plan". The Sunday Oregonian, p. C2. ^ Federman, Stan (June 16, 1984). "Inspectors bid goodbye to Tri-Met test". The Oregonian, p. C5. ^ Federman, Stan (May 23, 1986). "Tri-Met plans to lay off 81, cut bus lines". The Oregonian, p. A1. ^ a b Hayakawa, Alan R. (July 1, 1986). "Tri-Met approves $71.9 million budget". The Oregonian, p.B1. ^ "Transit professionals single out Tri-Met" (September 27, 1989). The Oregonian. ^ Oliver, Gordon (August 18, 1996). "Tri-Met adopts global technology to track bus fleet". The Oregonian, p. D1. ^ O'Keefe, Mark (September 1, 1997). "New MAX cars smooth the way for wheelchairs". The Oregonian, p. B12. ^ "Easy-access buses hit the streets in Portland" (December 15, 1997). The Oregonian. ^ Redden, Jim (January 12, 2007). "Bye-bye, bus mall as we know it". Portland Tribune. Retrieved April 4, 2015. ^ Redden, Jim (May 21, 2009). "TriMet: Mall can be safe, orderly". Portland Tribune. Retrieved April 4, 2015. ^ Rivera, Dylan (May 28, 2009). "TriMet adopts cuts, warns of more later". The Oregonian, p. B1. ^ Rivera, Dylan (August 12, 2009). "The days of a free bus ride are over". The Oregonian. Retrieved 2009-08-13. ^ Tribune staff (August 28, 2009). "New MAX line opens downtown". Portland Tribune. Retrieved April 4, 2015. ^ Rivera, Dylan (September 12, 2009). "Riders pack MAX Green Line on first day of service". The Oregonian. Retrieved 2009-09-27. ^ Redden, Jim (September 13, 2009). "Leaders heap praise on new MAX Green Line". Portland Tribune. Archived from the original on June 8, 2011. Retrieved 2014-05-13. ^ Bailey Jr., Everton (August 30, 2012). "TriMet boosts most fares starting Saturday; some routes changing". The Oregonian. Retrieved April 28, 2018. ^ "Adult Fares and TriMet's Fare Zones ". TriMet. Archived from the original on June 26, 2012. Retrieved April 28, 2018. ^ Njus, Elliot (September 12, 2015). "The wait's over: TriMet's Orange Line, Tilikum Crossing up and running". The Oregonian. Retrieved September 16, 2015. ^ Mesh, Aaron (August 19, 2018). "In Two Weeks, Some Portland Buses Will Run 24 Hours a Day—Including a Line to the Airport". Willamette Week. Retrieved March 15, 2019. ^ Njus, Eliot (March 23, 2016). "Metro, TriMet bus rapid transit goes back to the drawing board". The Oregonian. p. A6. Retrieved October 26, 2018. ^ "Transit Action Plan" (PDF). Powell-Division Transit and Development Project. Metro. June 2015. Retrieved July 20, 2015. ^ Njus, Elliot (March 23, 2016). "Powell-Division rapid bus proposal would be slower than existing bus". The Oregonian. Retrieved November 3, 2016. ^ Njus, Elliot (May 26, 2016). "Powell likely to be dropped from Powell-Division rapid bus project". The Oregonian. Retrieved November 3, 2016. ^ Keizur, Christopher (November 10, 2016). "Vision for Division rapid bus line OK'd". Portland Tribune. p. A13. Retrieved July 5, 2017. ^ Njus, Elliot (September 8, 2016). "Proposal would cut Mt. Hood Community College from planned rapid-bus route". The Oregonian. Retrieved November 3, 2016. ^ Fuggetta, Emily (December 14, 2011). "TriMet board votes to approve Boring withdrawal". The Oregonian. Retrieved January 3, 2013. ^ Rose, Joseph (January 9, 2013). "TriMet board member demands action in light of investigation by The Oregonian." The Oregonian. ^ Rose, Joseph (January 10, 2013). "TriMet driver fatigue: Reaction to The Oregonian's 'culture of exhaustion' investigation." The Oregonian. ^ Rose, Joseph (January 5, 2013). "TriMet overtime: 'Exhaustion has become part of the culture' at transit agency." The Oregonian. ^ Rose, Joseph (December 23, 2013). "TriMet driver fatigue: New work rules spurred by Oregonian investigation end marathon shifts behind the wheel". The Oregonian. Retrieved July 11, 2017. ^ "Transit Investment Priorities (TIP) FY15". TriMet. Retrieved 30 December 2014. Wikimedia Commons has media related to TriMet. This page was last edited on 16 March 2019, at 11:22 (UTC).